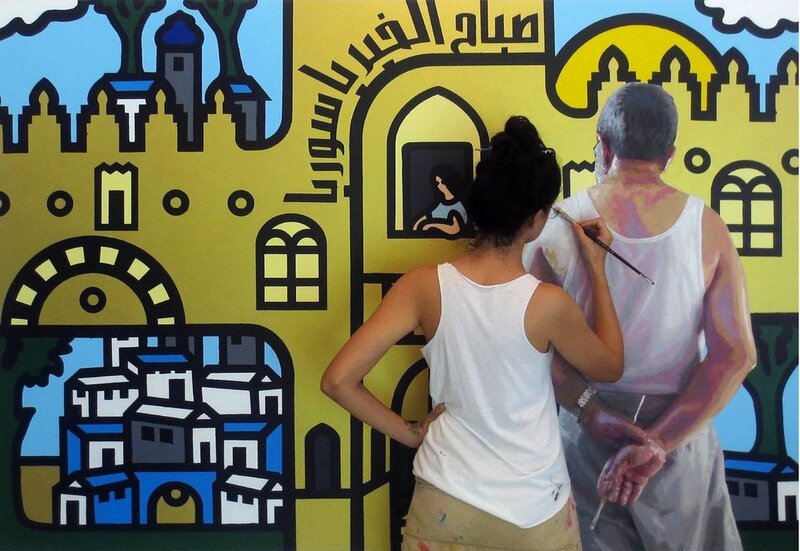 Born in Dubai to Palestinian parents, Rasha Eleyan is a painter, illustrator, animator and teacher. She talks to me about her childhood passion for art, cultural influences on her craft and her belief that "Creativity is all about doing and not waiting for inspiration". I’m a painter and an illustrator. I also offer corporate Peranakan inspired art workshops. I think an artist’s creative journey starts in their early childhood. It's what I have been known for and praised for since I was a kid. That paired with the fact that I am happiest when I draw or paint, makes me quite passionate about art. You graduated with a degree in Fine Arts in 2000 but didn't start a career as an artist immediately. Why? Immediately after I earned my Bachelors degree in Fine Arts, I was offered a job at Walt Disney Television in Singapore and I happily accepted it. Most artists have interests in different media and styles. Although my degree (and my biggest passion) is in drawing and painting, animation and illustration have had a tremendous influence on my career and life as an artist. I was working as an illustrator/animator and painting simultaneously as well in the period immediately after my graduation. Painting needs it's time and its space, so I waited till I was ready to go full-time. Do you focus on any specific subject matter via your art? As many artists I create art that can be financially rewarding but mainly I paint because of the compulsion to create and the artistic satisfaction I get. My signature style is combining realistic elements with pop art references in my paintings. I derive inspiration from architecture, culture and current events, whether from my Middle Eastern origins or my current home in southeast Asia. I seem to be highly inspired by Culture. Creativity means doing, I don’t believe in waiting for inspiration. You just have to keep doing and inspiration and creativity become second nature. What do you look for in a creative brief from a client and how do you develop your commissioned work? When speaking to a client, I like to focus on the feel of the idea they are trying to portray through the artwork and where they plan to display it. So a corporate commission would have a different feeling than one for a family portrait for example. After chatting with the client and discussing elements and such and understanding the brief, it's Sketch,Sketch, Sketch. Whether it’s a personal or a commissioned piece of work, it has to take its required period of study. Several sketches are presented and edited when necessary while observing the artistic integrity of the work. Once the final sketch approval is granted, it’s time to work on canvas. This finally results in the work that is true to the final and approved sketch. Ideas are in the air and it's easy to be inspired by many things, but visual inspiration for me, comes mainly from my father Nasr Abdelaziz's artwork and it’s also easy to tell the influence that Roy Lichtenstein has on my art. As I mentioned earlier, culture has a deep impact on my work. As most Arabs I was shaken to the core, by the highly unlikely chain of events that started in late 2010 in the Middle East- the period that came to be known as the Arab Spring. Overwhelmed with inspiration, I started making paintings depicting the events. Each of these paintings consisted of two elements - the background in an acrylic pop style depicted the event, the foreground with a realistic figure in oil observing the scene as we all did, represented the passive observer or the higher self. This inspiration lasted some years and was gradually replaced with frustration. The previously expressed conviction became broken and what was inspiring in 2010 is now replaced with new ideas, born of this frustration and the chaotic aftermath of the “Arab Spring”. In my fruitless pursuit of truth, I found refuge in the undeniable glory and the sentimental charms of our Arabic cities that regularly produce intellectuals, musicians, poets, writers and artists in abundance, and of a past so glorious, it is referred to as the cradle of civilisations. The outcome of these cultural inspirations was the series, Arab-spring & The Cradle of Civilization , a collection that lifts the spirits and inspires hope in a time of grief and chaos. How has technology changed the way you work and what are the opportunities and challenges it presents to artists such as yourself? I’m sort of classic in my approach towards art. However I’m starting to look beyond painting on canvas and am exploring new media such as laser cutting as well. I like to make use of technology but never reach the point of mass production, although it’s common practice around some established artists. I think of it as the death of the artist. Creative and cultural investments are often de-prioritized during tough economic times as they are deemed nice to have but not necessary. What do you think can be done about this? This can be avoided by spreading cultural and artistic awareness on a daily basis so that the arts are a way of life rather than a commodity. Art inspires and hopefully leads to success or just a better morale during tough economic times. I think art competitions for the youth can be extremely motivating for the creative ones. What are some of your favourite works ? The layout of this painting is inspired by a painting of Jerusalem by my father, the prominent Palestinian artist Nasr Abdelaziz . The passive observer portrayed by the realistic figure in oil and in actual size is in fact my father who agreed to pose for me for this painting. 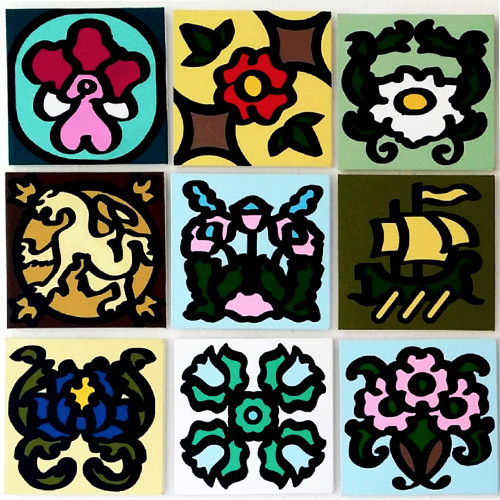 The elaborate design and brilliant colour palette of the Peranakan culture provided the inspiration for this contemporary Acrylic on Canvas collection of standard sized paintings of Peranakan Tiles. The standard size makes them easier to pair with other "Tile paintings" in the true eclectic fashion of the Peranakan culture. I also conduct acrylic on canvas painting workshops inspired by Peranakan tiles for adults and children. Rasha's work can be viewed on her website and on Instagram. Information on the Peranakan workshops she conducts can be found here.